As any veteran of internet blackjack will attest, a successful player is one who is intimately familiar with every aspect of the game. They know how to manage their money, control their libidinous impulses and can recite basic strategy rules as easily as they can their A, B, C’s. But for many players, the simplistic premise of internet blackjack—trying to get closer to 21 than the dealer without busting—belies the inherent difficulty of the game. As a result, they are often unprepared for its rigors and wind-up turning a relatively favorable game into a windfall for the house. Complicating this further is the fact that casinos—both online and terrestrial—often have subtle variations in the rules that affect the overall potential return. Notice how these subtle changes in rules alter the house’s edge. In Game IV, the casino uses four decks, has the dealer hit soft 17s, restricts doubling and fails to offer a surrender option, resulting in an edge that is substantially higher than casinos with more “player friendly” rules, such as in Game I. Unfortunately, there is often little recourse for patrons of traditional casinos—it’s not always possible to simply leave in search of a better game. That’s one of the major benefits of Internet blackjack. Online players suffer no such geographical constraints, and may come and go as they please. As such, it behooves all internet blackjack players to take advantage of this feature, and spend a little extra time previewing a site before taking the time to download the software. 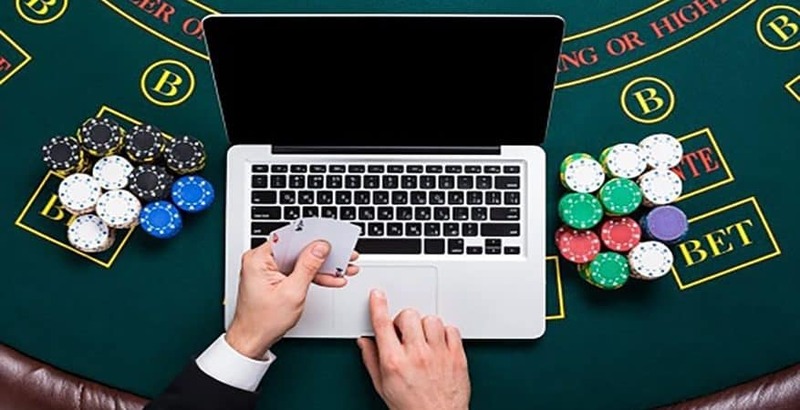 Of course, not every blackjack-style game on the Internet is going to fall under the category of “conventional.” New versions of this highly popular game are always popping up online, some taken almost directly from traditional casinos while others have been specifically designed for the online gambling community. Below are descriptions and the basic rules of a few of the more popular online variations of internet blackjack. Although similar to conventional blackjack in most regards, Internet Blackjack Switch allows players to do what is generally considered cheating: trade cards between two hands. • Internet Blackjack Switch is played with six decks. • Dealer hits a soft 17. • Players may double on any two cards. • Players may double after a split. • Players may not re-split. • Winning player blackjacks pay even money. • Player loses total wager against a dealer blackjack. • A dealer total of 22 will push against any player total of 21 or less. However, a player blackjack will still beat a dealer’s 22. All other rules are based on conventional blackjack, making it one of the more familiar blackjack variations. Blackjack Switch is available in casinos powered by software provider Playtech. A British version of blackjack, Pontoon has been steadily gaining popularity in online gambling circles for the past few years, and is now offered by a variety of software providers including Real Time Gaming and WagerLogic. 1. Pontoon—An ace and any 10-point card, including after splitting. 2. Five-Card Trick—Any five-card hand that does not bust, regardless of total point value. 3. 21 points or less—Non-busted hands that value 21 points or less with four cards or less. Hand strength is equal to the total number of points. • Players may stand on any five-card hand, or on a total value that is greater or equal to 15. • Players may hit at any time, including after doubling. • Doubling is allowed on two to four cards, but only once per hand. That includes after splitting and once for each split hand. • Players may split two cards of equal rank and may re-split once, up to a total of three hands. When the player splits, the first card dealt to each hand shall be automatic. • If a hand busts, the player immediately loses. • After players have played their hands, the dealer exposes his two cards and will draw until their value totals 17 points or more, or results in a five card hand. • The dealer hits a soft 17. • The dealer then compares his hand to each player’s hand and pays winning pontoons and five card hands 2-1 while all other winning hands pay 1-1. Although similar to internet blackjack, be sure to firmly understand the rules and variations of Pontoon before playing, as some of the key options can become confusing. Also, be sure to review the “Rules” section of your selected casino for additional rules, as online casinos sometimes alter them in ways that can adversely affect the player. • An ace is only valued as one point. All other card values are identical to traditional blackjack. • Players receive two cards face up while the dealer receives only one card face up. There is no hole card. • Players may hit, stand, surrender, double or split. • Players may double at any time. This includes redoubling and doubling after splitting cards. • Splitting is allowed on any two cards. • Surrender is available at any time. If a player surrenders, half of the total bet is forfeit. • The dealer wins all ties. • If a player is dealt an ace and two 10-value cards, the hand is called a “Caribbean 21” and is ranked higher than all other 21 point hands. A Caribbean 21 pays 3-2. All other winning hands pay 1-1. While this game does have some disadvantages—such as the dealer winning all ties—when played according to optimal strategy it offers a surprisingly low house edge of about 0.19%. There is a lot to offer the internet blackjack player in today’s online gambling world. Online casinos provide access to some of the best games around, from classic versions that you can find in any traditional casino, to the more exotic variations that exist only on the web. In addition to these exciting internet blackjack variations, online players have the unique advantage of hopping from casino to casino in search of the most favorable rules and the very best odds. Play free internet blackjack games in our Casino Games Room or read more about online blackjack.